In October, I will perform the next iteration of The MineThatData Elite Program. To date, we've only lost one (1) participant ... that's it! Always adding new participants, the program has become the way for brands to understand how they stack up against industry averages. Cost for New Participants = $2,500 per run. Data Requirements and Analyses are outlined by clicking here. Your commitment (and the blessing of your Legal Team, a team that frequently requires long lead times) is required by October 1. Payment is required by October 1. Data is due on October 24. Analysis will be completed no later than October 30. Since your Legal Team is likely the biggest stumbling block to getting entrance into the program in a timely manner, please take the time to engage those folks right now. And for crying out loud, this program is close to free. Think of the money you throw away to Google and Facebook and Retargeters and Research Reports and (for catalogers) your favorite Co-Op(s). This costs you almost nothing and you actually get something for it!! Contact me right now (kevinh@minethatdata.com) and get yourself into the next run of the program!! It's 2002. I'm sitting in the CMO's office (my boss) at Nordstrom. We're setting budgets for 2003. I look at the profit-and-loss statement, and two rows stick out to me. Net Sales = $8,000,000,000 (yup, that's eight billion). I pull out my calculator (yes, I had a giant calculator back in 2002 ... the CFO of the online channel called it the 'Green Monster') ... and I performed a bit of math. Ad-To-Sales Ratio = $144,000,000 / $8,000,000,000 = 1.8%. I looked at my boss, the Chief Marketing Officer. I asked a simple question. "Is that right? Our ad-to-sales ratio is 1.8%?" She gives me this dumbfounded look, and says something along these lines. "I'm sure we could find ways to cut the fat out and lower it, if that's what you are asking." That wasn't what I was asking. Key competitor Macy's has an ad-to-sales ratio of around 6%. Their business is less healthy. Many e-commerce brands have ad-to-sales ratios between 5% and 15%. They spend a lot of money on Search and Facebook. Many e-commerce brands "hack" their way to sales not by spending ad dollars but by optimizing the online experience coupled with word-of-mouth from social/mobile endeavors. The best catalog brands have ad-to-sales ratios between 10% and 20%. Lands' End, currently struggling, has an ad-to-sales ratio of around 14%. The worst catalog brands have ad-to-sales ratios between 25% and 40%. Yes, I said 40%. I see it happen all the time. You cannot tell a cataloger with a 40% ad-to-sales ratio to mail fewer catalogs ... the reason the ratio is 40% is because the staff LOVE to mail catalogs ... they get more satisfaction from putting a catalog together than they get from generating profit. 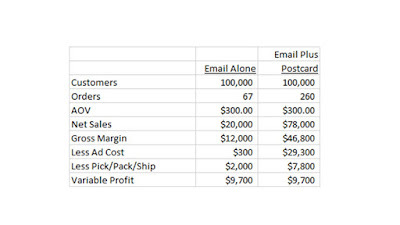 Ad-To-Sales Ratios are dependent upon Gross Margin percentages. If Gross Margins are north of 60%, you can absorb an Ad-To-Sales Ratio around 30%. If you are Best Buy, no such luck ... your Gross Margins might be +/- 25%. An Ad-To-Sales Ratio of 30% would bankrupt Best Buy. So your Ad-To-Sales Ratio must be sufficiently lower than your Gross Margin percentage. Having said all of that, the most profitable brands I work, after accounting for business model and gross margin structure, have Ad-To-Sales Ratios that are low. Customers love the merchandise these brands sell, and consequently, they do not need to be advertised to in order to buy something. In fact, the following sentence could be repeated after every blog post I write. The most successful brands I work with earn customers who love the merchandise sold by the brand, and as a result, these brands do not need to advertise to generate sales." For the next few weeks, I'm going to talk a bit about what a healthy business looks like. Between my Diagnostics projects and my Merchandise Forensics projects, I have data points for about 100 e-commerce, retail, and catalog brands over the past three years alone. Good data points - one row for every item a customer purchased for the past five years. In a typical year, I analyze about 500,000,000 rows of customer purchase transactions ... about 5,000,000,000 rows since founding MineThatData. Not Google-sized data of course ... but more transactions than your favorite vendor or trade journalist analyze within a Diagnostics / Merchandise Forensics framework. So I know a little something about what a healthy business looks like. If we want to Make Commerce Great Again, we're going to have to get away from our myopic focus on campaigns. You cannot understand how ants behave by studying individual ants. Similarly, you cannot understand how customers behave by studying individual campaign performance. Tomorrow, we'll begin talking about healthy businesses. If the series goes well, I'll assemble a booklet based on the topic. I know, I know, you are a Marketer and it is hard to figure out how to deal with your Merchandising Team. They have the reporting. They host the meetings. They own the Merchandise. You don't have any say, any input. I had the good fortune of working for an Accountant early in my career. Accountants were to 1990 what #DataScientists are today ... they had the data, and they knew how to calculate profit. This gave the Accountant an enormous advantage over everybody else in meetings. Gold = 30%+ Variable Profit. Green = 20% - 29% Variable Profit. Blue = 10% - 19% Variable Profit. Red = < 10% Variable Profit. Each item in each spread was summarized via a profit-and-loss statement. This is where the Accountant took over the meeting, though she didn't host the meeting. "This item on page six has a 47% return rate. Why would we feature such an unprofitable item on page six?" "Why is the best selling item in the catalog on page 139?" "Did we purposely put crappy merchandise in this spread, and if so, why?" "Do you realize that pages 20-39 were all Red, and therefore, all essentially unprofitable? This means I have to reduce circulation by 5% to make the numbers work. We cannot afford to lose that much demand. What is the plan to fix this next year?" "Why did we only buy 800 widgets and then run out of widgets when last year this same spread sold 3,800 widgets? Why would we do that?" 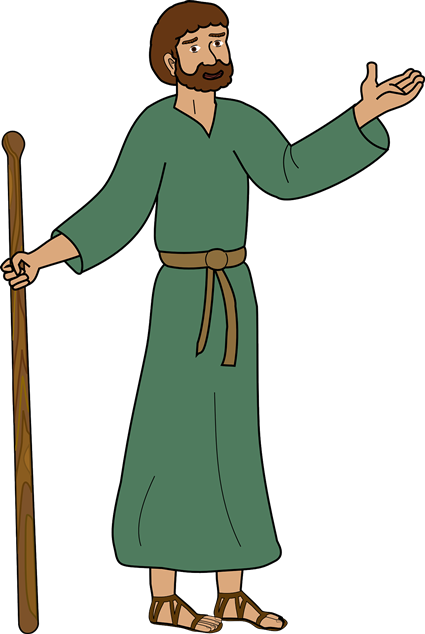 Was the Accountant a popular person? The Accountant became the GM of a Merchandise Category - and years later, founded a business and sold it to a major brand for tens of millions of dollars. That's what you can do. When you are meeting with your Merchandising / Creative business partners, have the numbers ... sales ... profit ... all key metrics (#KPIs) at your disposal. You should create the reporting template. Make yourself indispensable. Not invited to the meetings? Then create your own monthly reporting format that you circulate company-wide. Feature key customer metrics in your monthly report. Feature key merchandising metrics (including new item development and sales/profit estimates for all items). Tell the company what is working and what is not working. Boss won't let you do this? Do it anyway. Or create something similar. Or share your reporting outside of the Executive Team, teaching your co-workers what is happening. Best of all - start sharing your efforts with your Finance Team - those folks tend to enjoy learning more about the business. Company culture won't let you do this? Go find another company to work for. New Merchandise Development (#NMD) draws many parallels to sports. Take my Milwaukee Brewers, for instance. They trade away veterans, and in exchange, they get prospects, prospects that may help the team win a World Series in 2022. Now, what happens when the Milwaukee Brewers acquire a prospect? Do they hide the prospect? Or do they have a system in place to give the prospect playing experience? They give the prospect playing experience! From Rookie Ball to Low-A to High-A to AA to AAA to the Major Leagues, there is a process in place to develop talent. New Merchandise is to our business what Prospects are to the Milwaukee Brewers. What process do we have in place to develop our talent (i.e. New Merchandise)? For 85% of us, we don't have a process. The cataloger hides new merchandise online and buries new merchandise on page 77 of a catalog, then boldly dots the cover of the catalog with a OVER 145 NEW ITEMS message. That's not a Process, that's a Best Practice. A Process is far more important. The e-commerce brand promotes winning items in an effort to "optimize conversion" #optimize, then laments when conversion struggles occur three years later and there aren't any winning items left. I work with companies that employ elements of a good New Merchandise Development Process (#NMDP). Let me give you a blended example of what good companies do. 200 of the items will achieve "Contending" status ... they will appear in the top 45% of annual item sales. 15 of the items will achieve "Winning" status ... they will appear in the top 5% of annual demand or annual items sold. Among items that achieve "Contending" status, the items average $3,000 in sales in the first three months after launch. Therefore, all new items that generate at least $1,500 in sales in the first two months after launch are immediately promoted on landing pages, the home page, and most importantly, are featured in email campaigns. This pushes more new items into "Contending" status ... instead of 200 per year, 300 new items per year become "Contenders". 20% of Contenders become Winners next year. Instead of 200*0.20 = 40 new Winning Items in two years, the process this company employs allows 300*0.20 = 60 new Winning Items to exist in two years. New Items benefit from low-cost digital channels. Winning Items explode by being promoted in high-cost offline/print/digital channels. But by having a Merchandising / Marketing partnership, and by having a New Merchandise Development Process, the company has more winning items in two years. And by having more winning items two years from now, the company grows faster and is more profitable. Best of all - the company can prove that "x" winning items are generated because of a good New Merchandise Development Process. I'm on the phone with a Vendor Executive. The individual, well respected of course and somebody that 50 - 100 of you (+/-) work with, is questioning a tactic applied by a client. The conversation goes something like this. Vendor: Why did you execute the strategy you executed? Kevin: Because we had test results, and the test results replicated themselves more than a dozen times. We knew this strategy was the most profitable strategy. The tests confirmed the strategy, over and over and over again. Vendor: But it's a dumb strategy, and you know it. Vendor: But why do the opposite of a best practice? Kevin: Because we tested the opposite of a best practice, and the opposite strategy outperformed the best practice in twelve consecutive tests. Vendor: Everybody knows my strategy is right. It's a best practice. I don't care what your test results and actual customer behavior revealed. I'm letting you know we are implementing the opposite of your strategy, and we don't need your help going forward. In fact, we're taking over the marketing function at this company. We're going to do things the right way from now on, ok? Vendor: I just don't get it. Are you stupid? Kevin: If you are going to make a change, make it. But then be accountable for the results, good or bad. If you are right, brag about it. But if you are wrong, you better be ready to call me and tell me you were wrong. Are you willing to be held accountable if you are wrong? Vendor: I know I am right. I am applying best practices. Everybody knows I am right. The data-driven people have it all wrong, of course. For if this were a data-driven world, the Vendor Executive would steal these results and apply them broadly across the vendor ecosystem. When I get myself into trouble, professionally, it's because I have test results that threaten the way somebody makes a living. My weakness is trying to appeal to the data, a strategy that seldom works when somebody makes a living requiring the opposite outcome I observe via test results. Such is the case with the Catalog Vendor outlined in this post. Ask your vendor if they have tested their tactics? Ask to see actual results. When you hear the phrase "best practice" thrown out into the middle of a testing argument, be wary. And if the vendor executive asks "are you stupid", know in the back of your mind that you have identified a truth at odds with what the vendor is selling. This is a perfect example of "moving sideways". The term came from an article about Wal-Mart's e-commerce business ... an employee discussed doing things that are completely unproductive but cause everybody to feel busy, to feel like they are being strategic. Look at the postcard once again. "Check your email for your 10% off promo code." Do you understand how hard it is to generate profit? Of course you do. You measure profit, right? RIGHT? Pretend that the postcard costs $0.29. You have to increase the effectiveness of your email marketing campaign by a factor of 3.9 in order to generate the same amount of profit. Take a look at this example for a home-based brand. What are the chance of quadrupling response? And why spend $29,000 to quadruple response in an effort to generate the same amount of profit? What else could you do with the money? Something innovative? Or something like this, where you are moving sideways? You can't listen to your vendor partners when it comes to marketing strategy. Of course your paper rep wants you to spend money on a two-step conversion process. Of course your printer wants you to spend money on a two-step conversion process. So you pay each party $29,000 and what do you get? Nothing. Not a penny. And that's assuming that you increase response by a factor of 3.9. You have to quadruple response just to break-even. Now yes, there's a chance that response increases by a factor of 8x and this works wonders. But on average, there's only a 10% to 20% chance that happens. The other 80% - 90% of the time, the paper rep and printer get paid, and all we get for our efforts is a shiny postcard with a two-step conversion process tied to a discount/promotion. What does that have to do with the merchandise we sell? 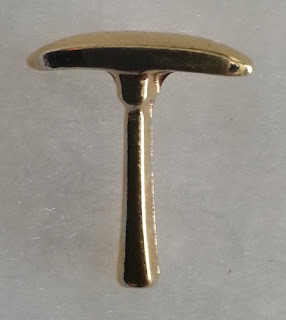 Do we have any passion about the merchandise we sell? Think about it. This isn't a Wayfair issue. This is an industry issue. Our industry has been taught to believe that two-step processes tied to discounts are good strategy. A good strategy, of course, is to feature merchandise the customer has to purchase right now. And if you don't have merchandise that the customer has to purchase right now, well, you've identified the problem with your business, haven't you? How did you answer this question? August 12 Question: Your merchandising team creates a new product line, one that is similar to an existing product line. The existing product line used to generate $10,000,000 in annual sales. Today, the existing product line generates $7,000,000 in annual sales, while the new product line generates $5,000,000 per year. Your merchandising team thinks that sales declined in the existing product line because the marketing team failed to properly market each product line. Your data shows you that customers rapidly switched allegiance from the old product line to the new product line. Describe how you will argue whether the new product is or is not a success when you meet with your Executive Team next week. Can the candidate articulate cause/effect when cause/effect cannot be tested and can be argued a million different ways via a million different analytical techniques? Can the candidate display empathy? Can the candidate argue calmly when unjustifiably attacked? Will the candidate ask for support from other Executive Team partners, or will the candidate fight alone? Can the candidate sell a point of view that can only be proven via correlation? Does the candidate just stare at you and say nothing? The goal of the question is to reveal character. In four out of five cases last week, I was looking for the candidate to reveal character. In one out of five cases last week, I was looking for chops/competence. I have a list of thirty-five questions I'd consider asking any Leadership candidate. I think it is important to constantly go back to questions that each candidate should answer ... allowing you to draw valid comparisons. Time for your thoughts ... what did you learn? What did you agree with? What did you disagree with? What are you looking for in a Leadership candidate? P.S. 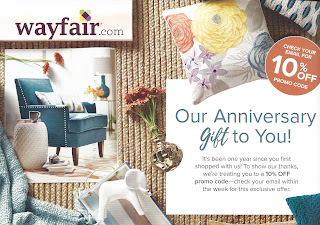 : Show me the merchandise that Wayfair features on the postcard? Oh, it's hard to tell? Of course it is hard to tell. 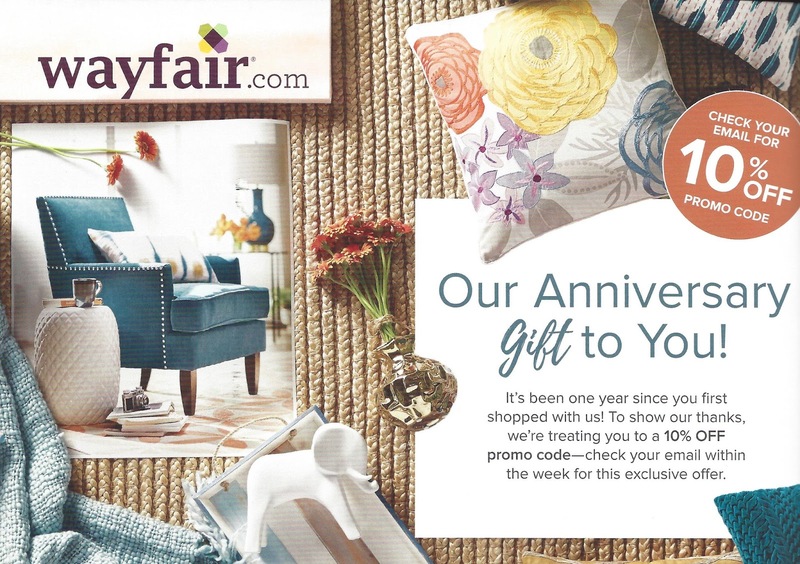 The printer and the paper rep and the marketer win here ... Wayfair is selling discounts/promotions instead of selling MERCHANDISE. Don't listen to your vendor partners. Recall this question from last week? This is the classic "short-term optimization" vs. "long-term opportunity" question. In the short-term, you have the data that proves you are right. But you could poison the brand in the long-term by optimizing in the short-term. This is the biggest problem I run across in my email analytics. The email guru, usually a Manager or Director, goes after short-term optimization tactics ... trying to maximize opens / clicks / conversions. After a half-decade, after a thousand messages that maximize opens / clicks / conversions via discounts, promotions, low-priced items, free shipping, and countless other games, gimmicks, and generic engagement nonsense (called 'codswallop' by some), the customer gets the message. The only customers who then respond via email are those who have been conditioned to perceive the brand as a brand that offers discounts, promotions, low-priced items, free shipping, and countless other games, gimmicks and generic engagement nonsense. Meanwhile, the CEO is (hopefully) trying to protect the future of the "brand". As such, the CEO cannot possibly offer facts / figures that defend her point of view. She's going to argue from a position of faith. Does the candidate side with faith? Does the candidate side with short-term optimization? Does the candidate offer a strategy not considered in the interview question? The answer to the question should reveal the type of Leader this person will be. You are not just hiring this person to do a good job, you are hiring this person to protect the long-term health of your business. In other words, the candidate better give you an answer that inspires Leadership confidence. A pithy optimization-centric answer without additional color / perspective likely disqualifies the candidate. As you surmised, there isn't a right/wrong answer to this question. I want to hear how the interview candidate approaches this question. Does the candidate firmly believe in Paid Search? Does the candidate align with the CFO? Does the candidate have ideas for what to do if the CFO wins the battle? Does the candidate think the CFO is an idiot? How will the candidate use data to prove the CFO right/wrong? How will the candidate use emotion or logic (or both) to sway the CFO? Will the candidate use actual customer data, or will the candidate use vendor/research/trade journal thought leadership to argue with the CFO? Will the candidate recommend testing various strategies with branded and/or non-branded terms. Will the candidate recommend testing various strategies with expensive keywords. Does the interview candidate get crabby? Is the interview candidate confident in the answer? Does the interview candidate have a condescending attitude toward the CFO? What examples can the interview candidate cite from prior experience? You want to hear a candidate who doesn't just cite the simple tactics that are publicly mentioned. You want a candidate to give you an original answer that makes you think. The candidate should make you think. Too often, the candidate starts blathering about obtuse bidding strategies and will throw out terms like "long tail strategy" to completely divert you from the fact that the candidate is not qualified to fill your job. Conversely, candidates will know their stuff inside/out, but will be unable to communicate their brilliance. The interviewer has to work really, really hard to pull the genius out in these circumstances. What do you want to hear from the candidate? Within a span of about 18 months, +/-, Macy's will close around 20% of their store base (click here). Few people are willing to acknowledge what digital does to a cost structure. In newspapers, digital renders paper useless, and the ad dollars tied to paper disappear in the process. In retail, digital renders commodity square footage useless, and the square footage disappears in the process. In catalog, digital renders commodity square inches useless, and the pages disappear in the process. Yeah, that's an interesting question. When you answer that question effectively and profitably, you've solved the disruption problem. Ask yourself what Zara, Forever 21, and H&M do that renders digital useless (or makes digital a slave to the in-store experience)? The answers are lying there, in plain sight. Then go apply the answers to your business. August 10 Question: Your catalog matchback provider tells you that $10,000,000 of total sales are matched back to those who received a catalog. 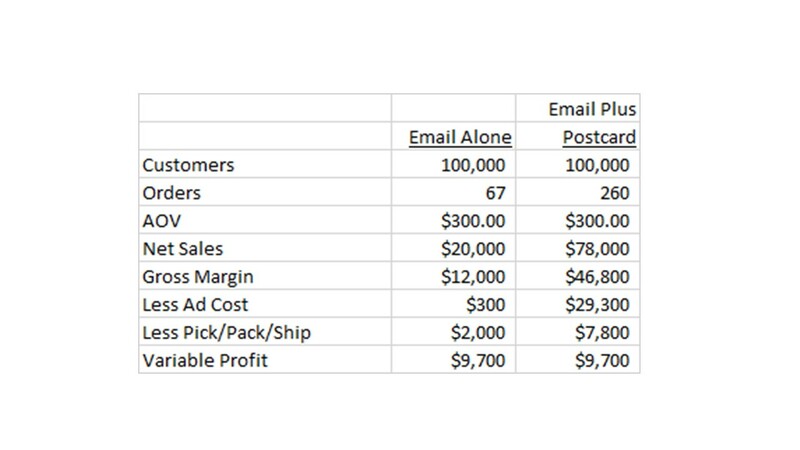 Your A/B testing strategy of not mailing catalogs to customers tells you that of the $10,000,000 total ... $4,000,000 are driven by the catalog and $6,000,000 will happen anyway if you stop mailing catalogs. Which set of numbers do you trust, and how would you communicate your recommended direction to your Chief Financial Officer and Chief Executive Officer? I am going to try something different for the next week two weeks. I am going to pretend that you are interviewing for a Leadership position. Each day, I am going to present you with an interview question. Your job is to work through the question, and provide a competent/credible answer. You don't get to offer vague responses ("it depends, Kevin"). You simply have to answer the question. Questions will be asked on 8/8, 8/9, 8/10, 8/11, and 8/12. The 8/8 question will be addressed on 8/15. The 8/9 question will be addressed on 8/16. The 8/10 question will be addressed on 8/17. The 8/11 question will be addressed on 8/18. The 8/12 question will be addressed on 8/19. Some of you are going to answer one specific question (you'll probably know what it is when you read it), and then some of you are going to be really mad at me when I discuss the answer to the question. Please Tell Which 3-4 Metrics I Can Use To Turbocharge My Business!!! FYI - head to the bottom of the post if you want to know what metrics you should be keeping track of ... read the commentary below if you want to know what happens when I tell you what metrics to keep track of. "I read an article that suggested there are three or four key performance indicators that can turbocharge my business. Could you please tell me what those indicators are? And make the metrics easy for anybody to understand, ok? Thanks, Craig Paperman." Tip #1: You cannot "turbocharge" your business by stumbling upon a metric. This is a lie sold to you by companies that provide software or consulting services that focus on "key performance indicators". Metrics and key performance indicators, or "KPI's" as the vendor community calls them, reflect what has happened. It isn't like there is some magical metric lying in the weeds that, if you only could discover it, would cause your business to increase by 40%. If that were true, then there would be a throng of consultants running around authoring the metrics and getting rich off of selling the metrics to you. Those people don't exist. Tip #2: If I tell you the metrics you should use, you will disagree with me and argue that you are right and my metrics are wrong. One of the great sadnesses of the past two years is a shift in how people deal with consultants. Ten years ago when I visited a company, folks argued about what to do ... how to spend money ... the channels to explore ... tactical stuff. Today, you visit a company, and everybody wants to argue about trivia. It's exhausting. It's pointless. And it's a distraction ... a distraction away from the real issues causing businesses to succeed or fail. Example: I recently visited a company and shared dozens of customer acquisition tactics ... this business was struggling to acquire new customers. Those in the meeting repeatedly discussed how every idea "wouldn't work for them" because they were "unique and special". Then, the attendees argued that customer acquisition wasn't important, because it is more important to get more demand out of existing buyers. Finally, the audience wanted to understand if maybe everybody was just "measuring things the wrong way?" See what I mean? This is exhausting trivia, and has nothing to do with growing a business. It sounds strategic, but it is not. It is a distraction away from the core issues that are hurting business performance. Tip #3: You already have the metrics you need, you just don't have the strategy or energy or corporate culture to capitalize on your metrics. This is when the audience gets angry with me. You already know that sales/profit are not where they need to be. You already have a count of new customers. You already have some sort of loyalty metric. You already know website traffic and conversion rates. You already know catalog response rates, by segment. You already have an embarrassment of analytical riches. If you are stuck, then the issue isn't metrics ... it's you ... you don't know what to do next, and that is frustrating. I hosted a session about customer acquisition ... I asked the audience "How many of you are ready to work hard to acquire new customers?" Can you guess the response? Of course you can! Almost nobody wanted to work hard. So even if you had a metric that opened the company up to a world of possibility, if nobody wants to work hard, game over, right? Corporate culture is a huge deal. Few companies have the culture necessary to push ideas across departments. If you had a metric that opened your company to a world of possibility, would you be willing to risk your career on the metric by pushing your strategy through the merchandising team, the creative team, the website ops team, your IT team, and your Executive Team? No? Then culture is your problem. Or you are the problem. Tip #4: You don't need to configure metrics perfectly to make a difference. Here's what I run into. I use the Comp Segment framework to determine if Merchandise Productivity is an issue or not. By running this framework across channels, merchandise categories, new/existing products, and price points, I can quickly diagnose what is wrong with a business. But when I share the framework and properly diagnose the issue, there's a fraction of the audience that pushes back ... "But are you truly measuring Merchandise Productivity?" ... "Wouldn't it be better if you measured it this way?" ... "Why don't you use our existing framework, then you'll see that everything is just fine?" This tactic is used by professionals to divert attention away from real issues. If the professional can get the consultant to argue and can discredit the consultant, then the professional doesn't have to implement a strategy, but can still look good internally because the professional hired a consultant and actually tried to fix a problem. You don't need to configure metrics perfectly to make a difference. You just need to DO SOMETHING ... MEASURE SOMETHING ... and then TAKE ACTION! Here's the framework I use when diagnosing what is wrong with a business. If you find yourself disagreeing with the framework or find yourself hopeful that somebody else can identify a key metric for you to look at so you don't have to go through the steps below, I invite you to re-read Tips 1-4 above. Step 1 = Rolling Twelve Month Graphs For The Following, Past Five Years. This analysis quickly points out dates when "things changed", and shows whether the business is headed down a proper trajectory or not. Total 12 Month New Buyers. Annual Repurchase Rate, Measured On A Rolling 12 Month Basis. Annual Demand by Price Point Bands ($0 - $10, $10 - $20 etc). Annual Demand by Attributed Marketing Channel. Annual Demand by Physical Marketing Channel. Annual Demand by Merchandise Category. Annual Demand for New Items (Past Year). Annual Demand for Existing Items (> 12 Months Since Introduction Date). Annual Demand for Orders with No Discount, No Promotion, Paid-For Shipping. Annual Demand for Orders Using Some Sort Of Discount/Promo. Step 2 = Comp Segment Analysis, Past Four Years, On A Monthly Basis, Buyers With Exactly 2 Purchases In The Past Year, Measuring What These Buyers Spent In The Next 30 Days. Average Next 30 Day Demand. 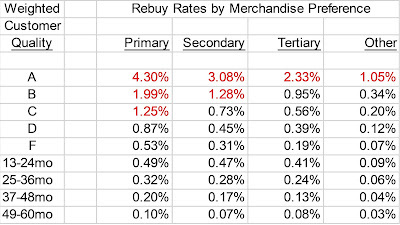 Repurchase Rate For Next Month. Comp Segment Spend per Repurchaser. Comp Segment Spend For The Next Month ... By Merchandise Category, By Price Point Bracket, By Attributed Marketing Channel, By Physical Marketing Channel, For New Items, For Existing Items, For Non-Promotional Business, For Discounts/Promos. 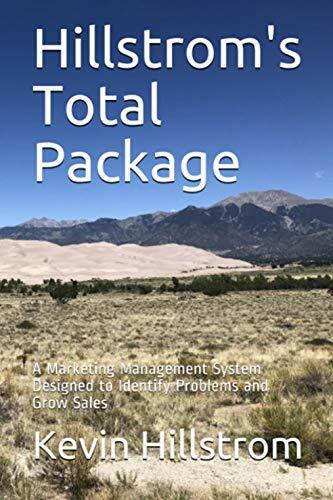 The comp segment analysis quickly determines when problems happened and where they are located ... hint - problems are usually caused by changes in merchandising strategy or reductions in customer acquisition spend. Step 3 = Comp Segment Analysis of New + Reactivated Buyers, On A Monthly Basis, Past Four Years. If Step 2 shows stable business and Step 3 shows a problem, then we know the problem is new + reactivated customer strategy. If Step 2 shows a problem and Step 3 shows a problem, then we know the problem is (most likely) merchandising strategy. Step 4 = Calculation of Winners / Contenders for Existing Items and New Items for each Merchandise Category, Annually, Past Five Years. Immediately, issues will surface, issues that cause reductions in catalog response rates, online conversion rates, and email productivity. Simple counts will illustrate the merchandising missteps that are haunting your business. Step 5 = Measurement of future value (what some call lifetime value). Step 6 = Five year business simulation that shows how your business evolves as you make improvements to new customer acquisition strategies. Once you complete Step 1, Step 2, Step 3, Step 4, Step 5, and Step 6, you will know what is causing your business to not perform at a healthy level. At this point, you have to get your organization to change course. Nobody in your organization wants to change course. They'll want you to go back and create metrics that validate that their course is "right" and you are "wrong". But you have the metrics. You are right. So if you cannot get your organization to change, then the issue isn't metrics ... the issue is your company culture, or your inability to sell ideas, or both. Are you willing to perform Step 1, Step 2, Step 3, Step 4 Step 5, and Step 6? The six steps give you all of the metrics you need to run your business effectively? If you don't have the time to perform Steps 1-6, contact me (kevinh@minethatdata.com), and I'll do it for you. If you are able to run Steps 1-6 at your company, you will identify why business is not meeting expectations. Then the hard work begins ... trying to encourage your company to change. Because most corporate cultures do not want to change, we instead look for magical "KPI's" that turbocharge a business. P.S. : I know, you don't want to do any of the Steps above. You want to know the 3-4 metrics that will turbocharge your business. Fine. Keep track of these four things. Merchandise Productivity, +/- vs. Last Year and 2 Years Ago. New + Reactivated Customer Counts, +/- vs. Last Year and 2 Years Ago. Long-Term Value by Source ... or in Total ... almost nobody calculates either. Your Organic Percentage ... the fraction of your business that happens even if all advertising is stopped. The healthiest businesses generate 90% or more of their volume without any advertising whatsoever (think Nordstrom) ... the worst catalogers generate almost none of their business without advertising via catalogs (vendors love this scenario). Now, there's one of three things happening here. The insights Watson provides are garbage. Nobody can properly interpret what Watson suggests. Folks can interpret and understand what Watson suggests, but refuse to act upon what Watson tells them, or cannot act upon what Watson tells them because of fear or inertia or internal politics. Metrics and insights are not the key, my friends. Doing something about what your metrics and insights tell you, that's what matters.